The sterile manufacture of pharma, cosmetic, food and life science requires dispersing technology especially designed for process safety and quality. Among these features are high-grade stainless steel materials, approved static and dynamic sealing systems, designs far-reaching free of dead space and with fine surface finishes, SIP and CIP cleaning possibility, and compliance with the required cleanroom classification. We use our many years of experience in dispersing technology in close cooperation with our customers to continue the development of our MEGATRON® in-line series to meet the highest level of standards. 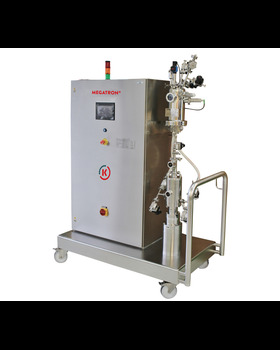 Our MEGATRON® MT-SV Inline Dispersing Systems for sterile production in cleanroom environments are available in four standard sizes and are used around the world. To meet the precise standards for sterile production the MEGATRON® MT-SV series was designed to meet the highest safety and quality standards in accordance with applicable international guidelines and standards. The highlights of our system can be seen in the column to the left. The emulsions and suspensions made with the Kinematica rotor / stator dispersing technology are characterized with the tiniest possible particle and droplet sizes and the finest degree of particle distribution. The results are achieved through a wide range of rotor / stator combination geometries graded from coarse to superfine as well as an optimal shear rate. Our engineering team will work with you to integrate our MEGATRON® MT-SV seamlessly into your production system. We can also create custom controls to meet your specifications. Our sales team will be glad to work with you on meeting your requirements.